Make sure that you have a chilled bottle at the ready and lay out your napkin and coasters on a level surface. Build your tower by placing each glass within the one below, centering it as you stack. Then, when you’re ready, pour champagne into the top glass. 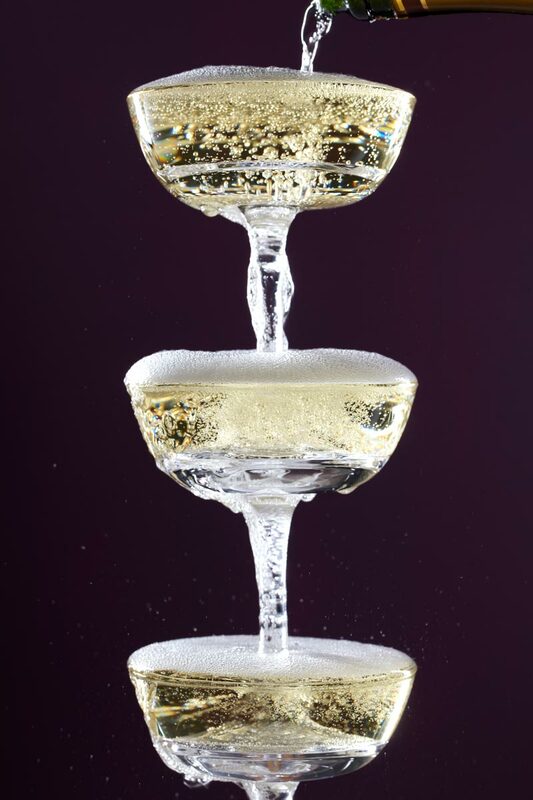 Pour at a steady pace so that the bubbles cascade gently from glass to glass. Stop pouring when the bottom glass is half full. When you’re finished, the top glass will be full to the brim. Remove it very carefully and be ready to take a sip! 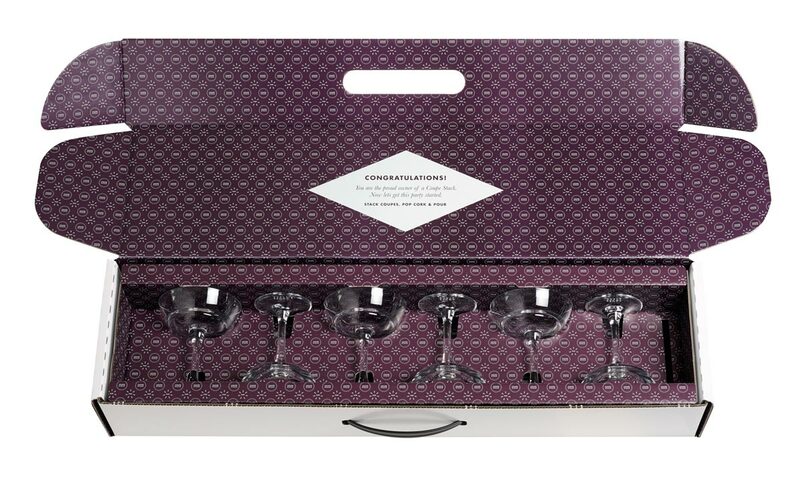 en, remove the remaining glasses one by one and place them on the napkin or coasters. 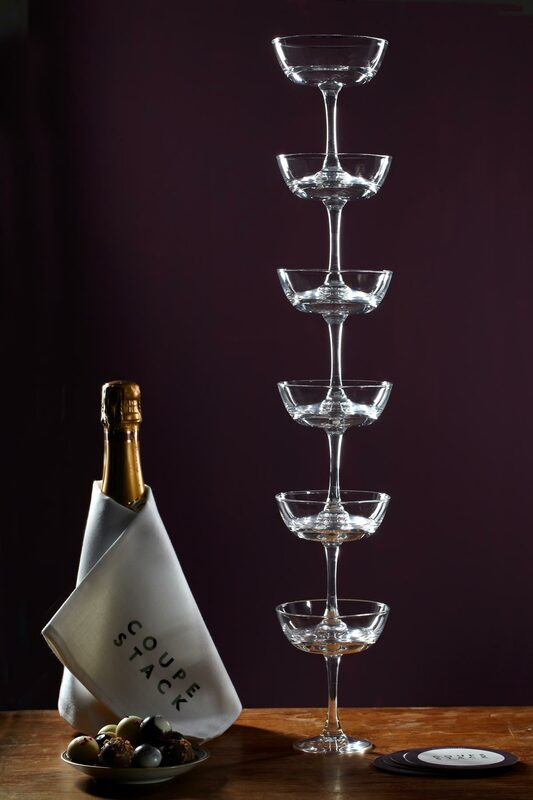 Thanks to the specially designed air tight pocket in each glass, the level drops as you lift it – leaving you with a perfectly measured coupe of champagne! 2 years ago, we sat down with a bottle of champagne and an old, crumpled black and white photograph. It showed our great uncle pouring a bottle of Pol Roger down a carefully balanced set of 8 champagne coupes. One directly on top of the next, the glasses made a spectacular vertical tower rising up at least a metre. is original set had been given to our great grandfather, Sir Arthur Page by e Maharajah of Cooch Behar. With a flair for roaring parties and a glamorous Hollywood actress as a wife, he wasn’t your typical Maharajah. 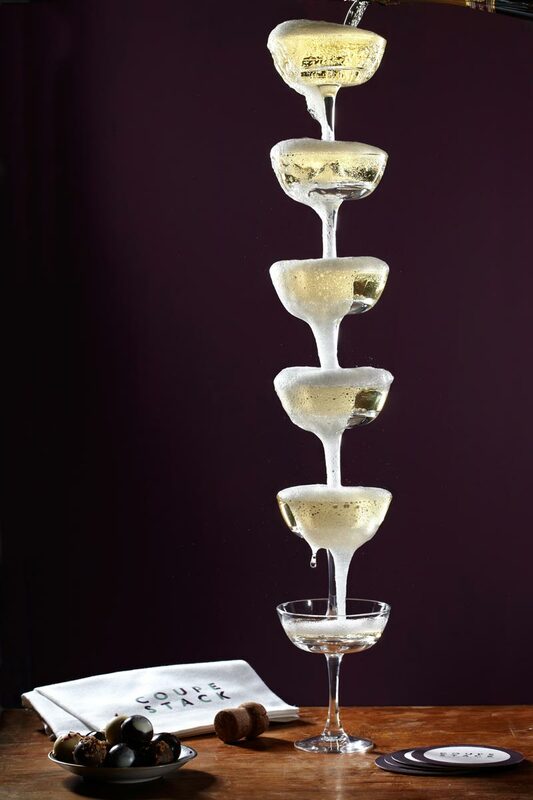 Guests at his decadent parties looked forward to the highlight of the evening when the Maharajah would delight guests with a spectacular champagne tower. Reaching incredible heights, each glass was stacked one on top of the other, coupe after coupe, while guests held their breath and watched. 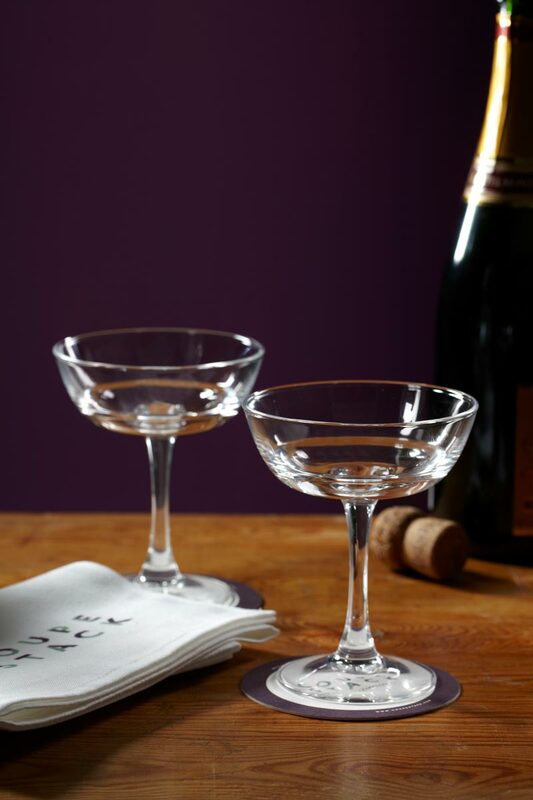 The Maharajah presented Sir Arthur with a set of these stacking champagne coupes as a gift when he returned to England. They have been used at family celebrations ever since. 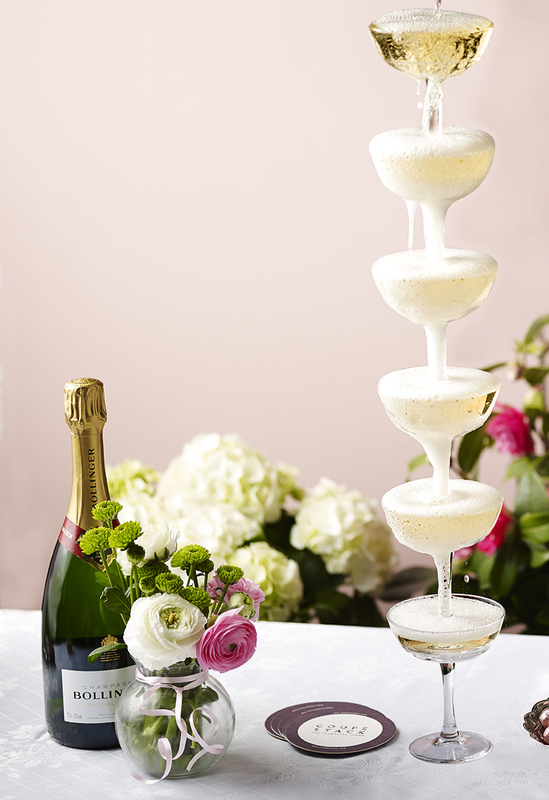 We wanted everyone to enjoy the theatre and elegance of this champagne tower so we decided to design our own. 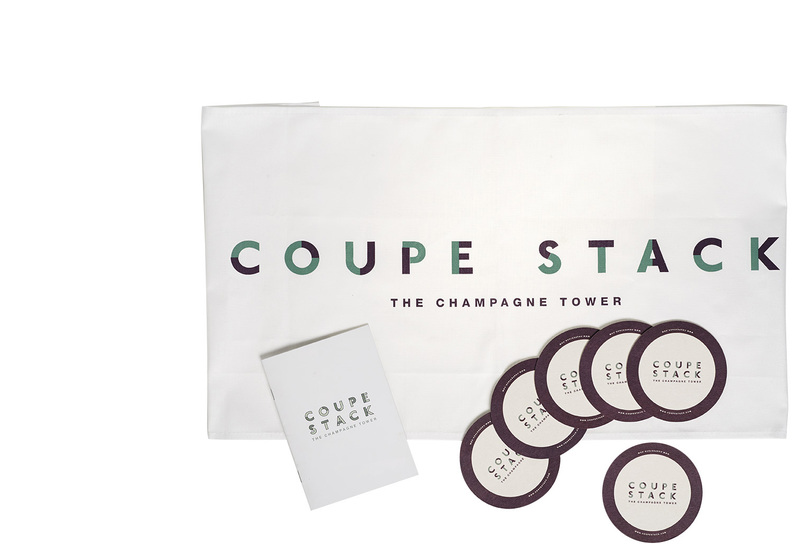 We hope you enjoy your very own Coupe Stack moments as much as we have enjoyed creating it. Glasses made in France is produced from 50% recycled material (toughenevvd glass). Our glasses are dishwasher safe. Our packaging card is sourced from renewable sources. Glasses made in France. 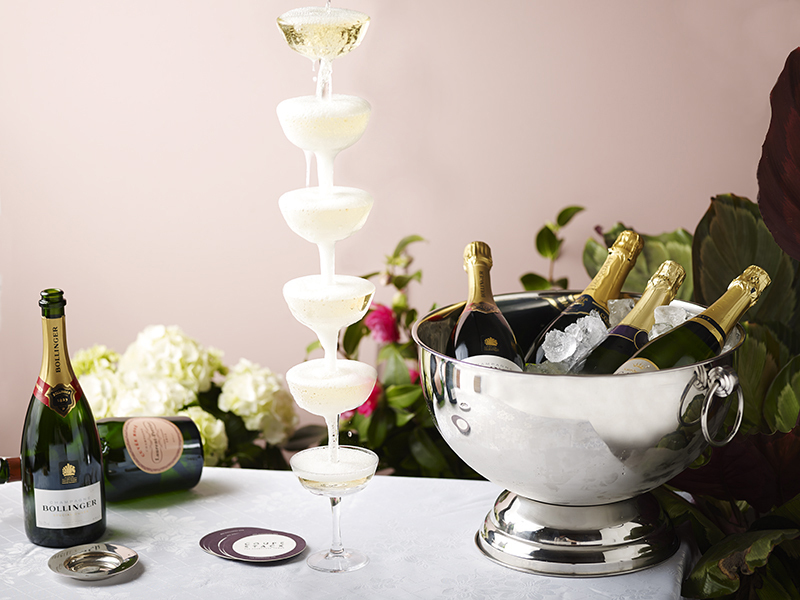 Coupe Stack can be lled with one full 75cl bottle of champagne. Coupe Stack is a brand name of Deerfeet Limited. The Coupe Stack is made in France from toughened, advanced Soda + glass. Card sourced from renewable forestation sources. Coupe Stack has been engineered and produced to the highest industrial standards and all reasonable care has been taken to ensure that the Coupe Stack can be safely used as described. Dishwasher safe.